Manila, Philippines - Team James won against Team Phil, 4-1 on Clear Dream Match II held on Saturday, August 24, 2013 at the University of Makati Football Stadium. Amidst bad weather condition as heavy rains poured, football superstars James and Phil Younghusband did not stop showing their best in front of the crowd. 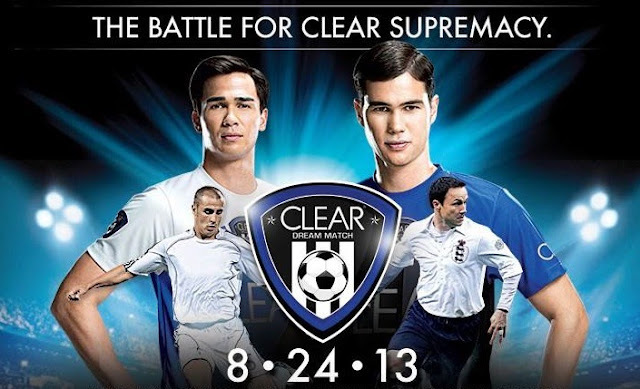 Football legends Fabio Cannavaro and Dennis Wise spiced up the action at UMAK and joined the Younghusband brothers in the biggest football all-star game put up by Clear, the number one men’s shampoo brand. James drilled back-to-back goals and one from Izzo El Habbib on the first half. This was enough to avenge his loss to Phil , a rousing 5-1 last year. Phil opened scoring as Saba Garmaroudi could not stop his shot in the 4th minute of game. Habbib scored again before the match ends in the 60th minute. Team Phil member Chris Greatwich bagged the Best Midfielder award. Habbib took home the Best Forward and Most Valuable Player (MVP) of the Game honors, while Bahadoran was chosen as the Favorite Player of the Game. James and Cannavaro were joined forces with Yves Ashime, Jason de Jong, Misagh Bahadoran, Saba Garmaroudi, Oussey Diop, Roxy Dorlas, Chieffy Caligdong,Tony Toni, Nico Bolzico, Jonah Romero, Ian Araneta, Simon Greatwich, Andrew Santiago, Daniel Matsunaga , Slick Rick, Fabio Ide, and Ref Cuaresma. Definitely, this year's competition raised the level of expectation. The event is sponsored by Smart, Greenwich, Seda Hotels, Adidas, Gatorade, Rappler and TechnoMarine. Proceeds of the match will be for the benefit of the victims of the recent flood in the country and the Tuloy sa Don Bosco Foundation.